Chimeco Eriacho of Ramah Chapter poses by a portrait of his grandfather, Jesus Eriacho, a Mexican who was captured by Apaches, raised by Zunis and eventually became the governor of Zuni Pueblo. If you look at a map of Ramah Chapter, it looks like moths got to it. Less than half the land located within Ramah's borders is actual tribal trust land, according to Chimeco Eriacho, 77, one of several elders collaborating on a history of the chapter. This most heavily checkerboarded chapter of the Navajo Nation, entirely separate from the "Big Rez," is also its own reservation, its own BIA agency, and the people are considered a separate band. Navajos have been living in the foothills of the Zuni Mountains since at least 1540, when early Spanish accounts of their war with the Zuni mention "Apaches" (probably Diné, whom the Spaniards lumped together with their Athabascan cousins) riding out of the mountains to the pueblo's aid. The Diné were nomadic at that time, explained Eriacho, coming here in the summer from as far away as Tohatchi to harvest the wild onions of the mountain meadows. In Navajo, this area is still called "Tl'ohchin’" ("Onions"). Although Ramah Chapter was recognized in 1957, the land was not officially withdrawn until 1979, when Jan Crull Jr., an attorney volunteering with the chapter, pushed through Public Law 96-333, giving the Ramah Navajo rights to their land. By this time, however, there were already large tracts of private land dotting the chapter like splotches on a pinto pony. According to Eriacho, some of these were to be deeded to the Atchison, Topeka and Santa Fe Railroad in 1880 as it completed its route from Isleta, N.M. to Needles, Calif., but the railroad chose a route farther north to be closer to the coal mines of Gallup. The feds then opened up the land grants to anyone who could develop them under the Homestead Act of 1862, unleashing a flood of Anglo settlement, mostly from the south. 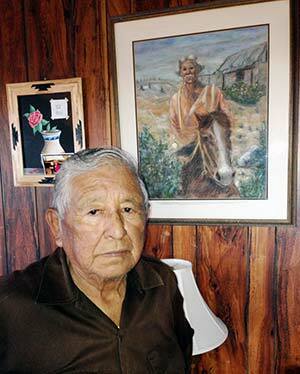 "The government never told us Navajos we could apply for those lands," Eriacho said. "If they did, things would have been different." Instead, Navajo sheepherders found their flocks competing with the white ranchers' cattle, resulting in some skirmishes. At the same time, the tiny Mormon settlement of Ramah, along the cottonwood-shaded creek bed, was growing and edging the migratory Diné out of the best grazing land. While the checkerboarding led to a diverse, interesting community where many people spoke English, Spanish, Navajo and Zuni almost interchangeably, it was impoverishing the Diné. "It's impossible to run livestock on land where every other mile, there's a different owner," explained Eriacho. Eventually the local Navajos got some relief when one of their leaders got the bright idea of fencing in the Anglo tracts. "Most of them didn't have water on their land," Eriacho said. "We were able to starve them out." The Ramah Navajos, who had no great interest in aiding the state or federal authorities, soon developed a reputation among some questionable elements in Anglo society for being able to keep a secret. Name: The name "Ramah," an Old-Testament city first mentioned in the Book of Joshua, was applied to the Mormon settlement along what is now New Mexico Route 53. It's a few miles from the headquarters of Ramah Chapter, which is referred to as "Ramah Navajo" to avoid confusion. The local Navajos traditionally referred to the area as "Tl'ochin'" ("Onions") for the wild onions they used to gather from the meadows of the Zuni Mountains. Major clans: Tsé Nahabilni, Haltsoo’ Diné'e, Tó Dich'’inii, Tó Baazhn’'ázh’. There is also a lot of Spanish, Mexican, Apache and Zuni blood among the people here. The Eriacho family, for example, is descended from Jesus Eriacho, a Mexican boy who was kidnapped by the Apaches, escaped and was recaptured by the Zunis, and eventually rose to be governor of Zuni. Famous residents: John Miller, an Anglo who claimed to be Billy the Kid, resided here into his old age and adopted a Navajo boy. Around the turn of the last century, Ramah began to attract more than its share of outcasts and criminals. The community of Candy Kitchen, for example, is named for a moonshiner's establishment during Prohibition. To explain the large amount of sugar he was importing to the remote area, the diabolical distiller made pi–on nut candy in the front of his shop and produced liquor in back. Then there were the Millers. A man calling himself John Miller, his wife Isadora and their adopted Navajo son set up a ranch on the edge of the reservation in 1881 -- the year Billy the Kid was supposedly shot to death by Pat Garrett in Fort Sumner, N.M. Rumors arose that Miller was in fact the notorious outlaw, having somehow faked his death and escaped. Shortly before his death, Miller himself confessed. He provided a detailed story of playing dead through his wake, and then escaping with the help of some sympathizers who replaced his body with that of a local Mexican who had died the previous night. The Ramah Navajos generally gave the Miller family a wide berth, Eriacho reported, although he has in his possession a 1909 contract between Miller and Eriacho's grandfather to purchase 100 head of cattle. In 2005, Tom Sullivan, former sheriff of Lincoln County, N.M., and Steve Sederwall, a former mayor of Capitan, N.M., disinterred Miller's bones to obtain DNA to match against the bloodstained wooden bench where the Kid lay after he was shot, but results were inconclusive. Fort Sumner has steadfastly refused to relinquish the Kid's body for DNA testing, since if it isn't the Kid's, there goes their only tourist attraction. Besides, the town says, a flood in 1904 washed away many of the graves and headstones, and they're not even sure that's Billy under his marker. For now, the mystery endures. The Millers aside, Ramah continues to attract "homesteader families, regular folks, hippies, Radical Faeries, Ramah Navajos, Zuni Puebloans, nihilistic survivalists, reclusivists, people who like their privacy, people who enjoy living simply, and many other Ôoutcasts' who live on the fringes of society," according to Wikipedia's "Candy Kitchen" entry. "It's a very diverse community, which makes it fun," acknowledged Pam Pickens, proprietor of the Inscription Rock Trading and Coffee Co., a local haunt just east of the reservation. "We have Navajos, Zunis, Mormons, a gay community -- and we all get along pretty well." In addition to the fringe-y human types, Candy Kitchen is the home of some animal outcasts. The Wild Spirit Wolf Sanctuary provides space for, at last count, 61 wolves, wolf-dogs, dingoes, foxes and rare New Guinea singing dogs -- in addition to five or six Malamute mixes that people turned over to the sanctuary thinking they were wolves (the latter are up for adoption, if you're looking for something that looks like a wolf but isn't). A $7 tour of the facility is well worthwhile if you're in the area, and they even have a campground for those who want to experience waking up to the blood-curdling sound of 61 wild and domestic canids howling in unison. Because Ramah Chapter got little help from the tribe before it was certified (and if you ask the Ramah Navajos, things haven't changed much), this is a place that has learned to take care of itself. Like Alamo, another satellite reservation, Ramah incorporated its school board in 1970, making it possible for the entity to write and receive grants. The board has since established many educational and community projects, including a clinic. There are also some charitable organizations helping the community to develop, most notably Oso Vista Ranch, which offers youth camps, sewing lessons, free tax preparation, adult education, a computer lab and other services. "Even though we're so diverse, I feel like this is a real community," said Margaret Merrill, founder and executive director of Oso Vista Ranch. "We work together with the chapter, the clinic, some private businesses -- we have wonderful support from the community that has allowed us to grow and offer more services every year." Make no mistake, this place is not heaven, in spite of its Biblical name. There are high rates of alcoholism and crime, and unemployment is high even for the Navajo Nation. The community's tiny jail is consistently overcrowded, and the BIA's recent allocation for a new one fell short of the projected cost. This is the place that, last year around this time, an 8-year-old left unattended by his parents was reportedly mauled to death by a pack of hungry dogs. Still, there's a sense of optimism here; a sense of pride in the community's diversity and quirkiness. Among all the oddballs, there are, says Merrill, "a lot of people that care."